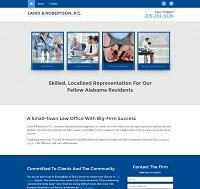 Laird, Robertson & Allen, PC., was established in 2001. Senior partner Phillip A. Laird, Sr., has engaged in the private practice of law for over thirty-one (31) years. Russell B. Robertson is in his fifth year as an attorney. The firm engages in a general civil practice, including representation of numerous municipal governmental clients. The firm frequently associates with other law firms from outside the geographical area in cases involving joint representation. The firm strives to maintain high ethical standards while zealously pursuing the interest of clients. Areas of specific interest include municipal/governmental law, education law, negligence/personal injury (plaintiff and defense), domestic relations, probate practice and corporate law, both litigation and transactions.